The murder of Abu Asvat has clouded Winnie Mandela’s legacy. Their deep friendship symbolized what could have been in the struggle for freedom. Abu Asvat. Image credit the Abu Asvat Institute. Although they did not realize it at the time, their fates were joined by the 1976 Soweto uprising. Abu Baker Asvat — “Hurley” to his comrades and family — ran a small, two room clinic in a squatters camp next to the area known as Chicken Farm in Soweto. A resident of the adjoining “Indian” township of Lenasia, Asvat was already known for treating his patients with dignity, making house calls whenever needed, and never turning a patient away — even when he or she could not afford to pay. During that long year of boycotts and protests, which the regime answered with brutal repression, students knew that his surgery was a safe-haven, and once so many wounded youth flooded his waiting room that he resorted to teaching other patients how to extract buckshot from backs and legs. Politicized by these events, he was a founding member of the Azania People’s Organization (AZAPO), a revolutionary Black Consciousness movement established in 1978. 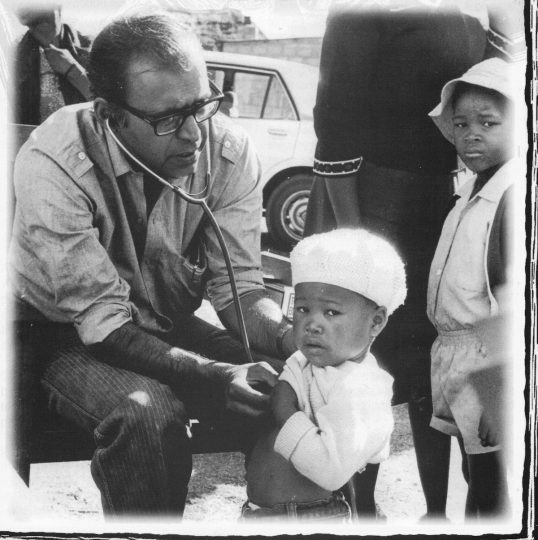 A tall, gentle man with a mischievous sense of humor, Asvat became revered as the “people’s doctor” and a “son of Soweto” for his medical activism, his tireless work amongst the poorest of the poor, and his capacity to connect with people from all walks of life. When he was murdered on January 27, 1989, he was probably the most well-known antiapartheid voice on questions of health and medicine. Renowned for her decades of political leadership (including, but far from limited to, fighting for the freedom of her husband), Winnie Madizikela-Mandela was a galvanizing force in the midst of the Soweto maelstrom. She had already remained defiant despite more than a decade of banning orders, torture, and imprisonment — including seventeen months of hell-like solitary confinement in 1969. When most of the ANC’s leadership were in prison or exile, she fought ferociously to maintain the presence and visibility of the banned organization. Working closely with students and black consciousness activists, she co-founded the Soweto Parents Association, ringingly denounced the police violence, and comforted the families of the fallen. At a moment when the boundaries between antiapartheid organizations were fluid, she embraced the language of black consciousness and gave soaring expression to the student’s aspirations. In retaliation, the regime vilified her in a misogynist campaign, arrested her without charge, and then exiled her to a desolate area near the small town of Brandfort, some 400 kilometres from Johannesburg in the Orange Free State. The apartheid state hoped that the banishment would silence her by severing her ties with other militants and the townships masses. It failed. In the early days of her isolation, a few resolute friends, including her doctor Yusuf “Joe” Veriava, traveled to her in order to provide her with health care and personal support. Asvat first met Madizikela-Mandela when he accompanied Veriava to Bandfort and they immediately hit it off. He soon took over her regular medical care and began to secure resources so that she could start a community center, soup kitchen, and programs to serve the needs of the neighboring black areas. Breaking the isolation of her banning, these projects were a lifeline for both Mandela and the local community. She later remembered: “He [Asvat] sought me out in Brandfort at the risk of torture and imprisonment.” Organizing clinics for squatter camps and the rural poor, they offered basic services to those utterly marginalized by apartheid’s racist health care system. These clinics sometimes treated over 500 people in a single day. When she returned to Soweto in 1986, they continued to work closely together. Defying the segregation that separated Soweto from Lenasia, she frequently ate dinner at the Asvat family home on Friday evenings. They were an extraordinary pair: the “people’s doctor” and the “mother of the nation,” the physician and the social worker, the Black Consciousness leader and the ANC stalwart. Photographed together more than once (including for the front page of the Star in the mid-1980s), they must have been conscious of the potency of their image. Their relationship embodied black unity (Asvat rejected the ethnic tag “Indian”) and political solidarity among the liberation organizations. During the factional violence between ANC supporters and Black Consciousness militants of the mid-1980s, this continued collaboration was a powerful statement. These years were a turning point. After the explosive protests and student boycotts of the early 1980s, the ANC called to make the townships ungovernable from abroad. As demonstrations were met by increasingly vicious repression and infiltration by agent provocateurs, political violence turned inward and “necklacing” (the execution of alleged police informants with tires doused in gasoline) became increasingly common. In her most infamous statement, Madizikela-Mandela declared: “together, hand in hand, with our boxes of matches and our necklaces we shall liberate this country.” In the midst of mass mobilization against apartheid, rivalry and state manipulation promoted low-level warfare between liberation organizations in some areas. (Asvat’s clinic was neutral ground — it was widely-known that he would treat the injured from any political current.) Necklaces were used against alleged “sell-outs” and, eventually, more indiscriminately against township residents who somehow failed to conform. While the apartheid regime remained intransigent, the character of the township uprisings began to change by the later 1980s. Youth militancy started to bleed into criminality that preyed on black communities. The Mandela United Foot Ball Club (MUFC) was a creature of this period. Formed as a project to get township youth off the street, the football club — coached by an ex-convict named Jerry Richardson — morphed into something else. Overlapping with members of the Mandela household, the football club began to function as her bodyguards. Increasingly rumors spread that the football club was acting as a gang, intimidating and robbing Soweto residents, and threatening boys that either would not join or wanted to leave. The MUFC was involved in violent clashes with other groups of young men, abductions, torture, and shootings. When the journalist Nomavenda Mathiane wrote an article on the activities of the football club, its members showed up at her house in an attempt to necklace her, but she was protected by her neighbors. Rumors spread about Madizikela-Mandela’s knowledge of and involvement in its activities. ANC leaders, including Nelson Mandela, asked her to disband the group (she refused). In 1988 the football club became involved in a conflict with the students of local high school during which one of the Mandela daughters was raped. After mutual retaliation by both sides, a group of high school students stormed the Mandela family home and burned it the ground. As neighbors watched house no. 8115 burn, some of them expressed regret that Nelson Mandela’s home was targeted, but satisfaction that Winnie would now know what it felt like to see her home burn. In the midst of the chaos, Asvat arrived on the scene and comforted Madizikela-Mandela by taking her in his arms. Then something dramatic happened, but we may never know exactly what. Asvat, who did not hesitate to make late night house calls in Soweto, started to ask trusted friends to follow his car home from political meetings in Lenasia. He would show up at friends’ houses, pace nervously as if he wanted to talk, and then leave abruptly. When his car tire went flat the night before he was killed, he drove home without stopping. He told his wife Zohra that an unspecified “they” were setting him up for attack. On the day he was killed, he made two attempts to see his lawyers. He then showed up hours late for family prayers. A devout Muslim, Asvat was so distracted that he held his hands the wrong way while praying. Two men shot Asvat in his surgery on the afternoon of Friday, 27 January 1989. He died almost immediately. The police quickly arrested Zakhele Mbatha and Thulani Dlamini for murder. The alleged motivation was robbery. However, the following Sunday a newspaper quoted Madizikela-Mandela to the effect that Asvat’s murder was related to his ability to substantiate child abuse accusations against Methodist Bishop Paul Verryn. This article was the first indication that Asvat’s death involved something more complicated than mere theft. The family conducted an inventory of the surgery and established that no money or valuables had been taken. From statements made by one of the accused and members of the Mandela household, an alternate scenario gradually emerged. Allegedly, Asvat had examined the youth “Stompie” Seipei after the football club had beaten him to the threshold of death. According to this version of events, Asvat and Mandela fought after he demanded that she take the boy to the hospital. When Seipei died, Mandela supposedly ordered Asvat’s assassination to eliminate a possible witness to murder. If multiple witnesses implicated Madizikela-Mandela, their testimony was contradictory and some of the witnesses were either involved themselves or unreliable. She strenuously denied these claims and the Truth and Reconciliation Commission found that the evidence did not substantiate allegations of direct involvement. (It held Madizikela-Mandela “morally responsible” for the human rights abuses of the football club.) Nevertheless, many people, including some who knew both of them well, never accepted that she was not somehow responsible. Seized upon and sensationalized by the press, these events became grist for a campaign to demonize Madizikela-Mandela and, by implication, the liberation struggle. This coverage made direct use of the sexist imagery of the violent, uncontrollable and powerful woman that the apartheid state had deployed in its dirty tricks campaign during the Soweto uprising. Many news articles from this period read like catalogues of the racialized and sexualized fears of white South Africa. Within the liberation struggle, the accusations were polarizing. For some within the ANC, the (male) leadership’s attempts to control and then distance itself from Madizikela-Mandela represented both its uneasy relationship with popular militancy and the second-class status of women in the organization. For others, the MUFC and accusations against Madizikela-Mandela embodied realities that were difficult to address without appearing to side with the oppressor: the abuse of power by struggle leaders, violence within black communities, and the loss of control over aspects of the struggle. These were costs of liberation that would soon become invisible through the narrative of national redemption that was built around the figure of Nelson Mandela and the public cult of the struggle leader.